Back in 1992, I had a correspondent in Lithuania who often visited Grodno. 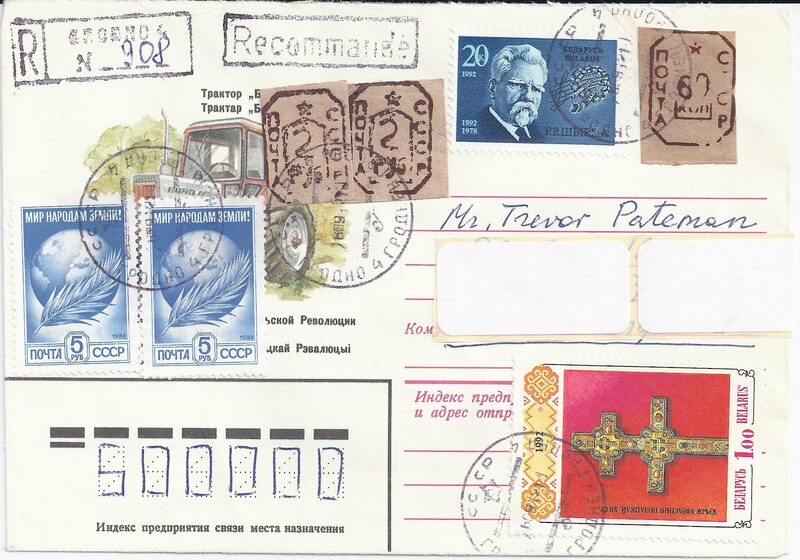 So I sent him some of my Belarus New Issues (I had too many ...) and asked him to use them on covers to me. One day - 3 OCT 1992 according to the Lewes cancellation on the reverse - I received the cover shown above. I was very excited. I had not seen anything like this before. It was overfranked (I think 15 roubles was the rate) but this time I did not care. For a time, I collected Grodno "brown paper" provisionals and, in fact, anything from post-Soviet Grodno. One of the things I noticed was that Grodno post offices seemed to have no black ink available - either you saw purple ink (as on the Registration cachets and canellations on this cover) or red ink. 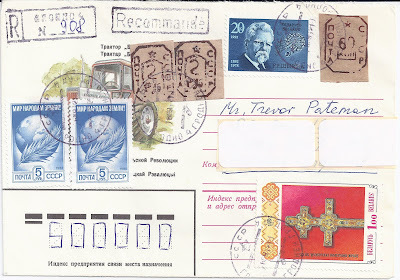 Well Trevor, I've got some of your covers.. very may Kazakhstan and a host of others. Unfortunately before I could really get round to researching everything the business in GB new issues took off, so I still have to work on most of them (and the GB postal history that I have! ).